Set one of the tortillas onto a cutting board. Sprinkle with half of the provolone cheese. Top with the prosciutto, roasted red peppers, artichoke hearts and remained of the provolone. Cover with the second tortilla. Spray the nonstick skillet with cooking oil. Then, carefully transfer the quesadilla to the skillet. Cover the skillet with the lid. Cook for 2-3 minutes, until the cheese is mostly melted. Press down with a spatula and then gently flip the quesadilla. Cook for an additional 2-3 minutes. Cut into eight triangles with a sharp knife. Serve immediately. There are whole articles and blogs and books dedicated to the pairing of wine and food. The same goes for beer and munchies … but what about soup? Some soups just go really fabulously with certain flavors. So, when I was thinking up a new sandwich, I created it with a tasty soup in mind. So, what’s the pairing? 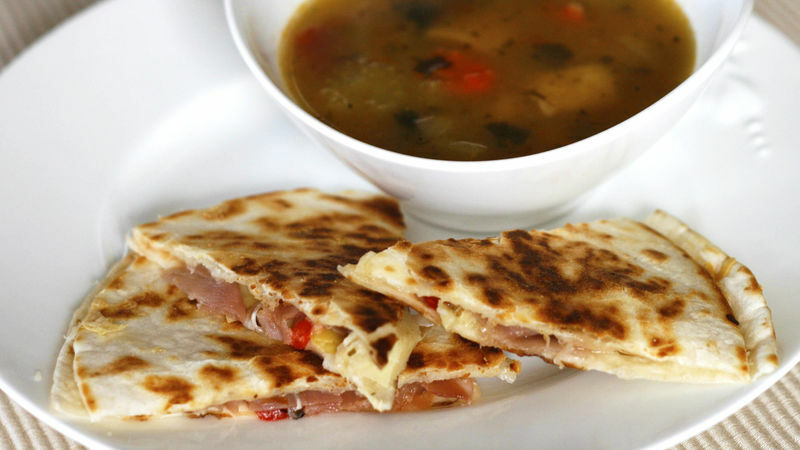 Progresso High Fiber Chicken Tuscany Soup goes really well with my Italian Panini Quesadilla. The sandwich has the flavors of a great Italian panini but trades the bread for tortillas. I love the saltiness of the prosciutto with sharp provolone, tangy marinated artichoke hearts and sweet roasted red peppers. But if you aren’t a fan of sharp provolone, trade it for mild provolone or much milder mozzarella. Progresso Vegetable Classics Tomato Rotini Soup would be delicious with a slice of Chicken Caesar Sandwich Ring. Progresso Vegetable Classics French Onion Soupgoes beautifully with “Healthified” Turkey Artichoke Panini. Progresso Rich & Hearty New England Clam Chowder would be super tasty with Fish Hero Sandwiches. Progresso Traditional Italian-style Wedding Soup would be super with a Grilled Chicken, Goat Cheese, Tomato and Basil Panini. What's your fave soup and sammie combo?